What? Two of my favourite things combined into one? I don't know which I would want more -- a giant sushi shaped like a Rupert Sanderson shoe (may I suggest uni to embellish that gold heel? 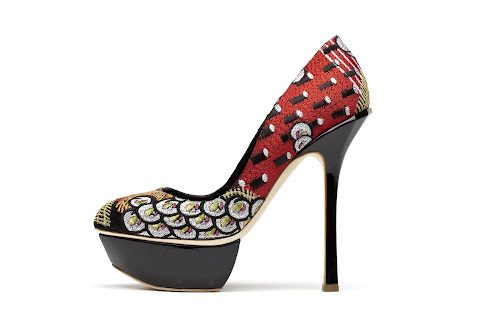 ), or a shoe that's covered in sushi embroidery. Actually, probably the former, because that one I can eat, and this shoe will just make me hungry all day. In fact, it's doing that right now, dammit. NO BLOGGING ABOUT FOOD-THEMED SHOES BEFORE LUNCH. Added that to my Bro Code Handbook. Or should it be my Salmon Roe Code Handbook? Anyway, onto the shoe. These are two different designs of the Waicato pump from Rupert Sanderson's pre-fall collection, the regular Waicato Sushi and the Waicato gold-flaked rose-red kid-trim sushi-embroidery version. Both of them seem to feature maguro-avocado makis, for those who are interested. What a great way to combine food and foot festishes. I mean, the words are only one letter different, might as well, right? Get them at the Rupert Sanderson Hong Kong stores (don't think they're available yet though, so call ahead!) and check out more from the pre-fall preview online here.